I really dig the bright colors in this tee shirt I received as a gift. 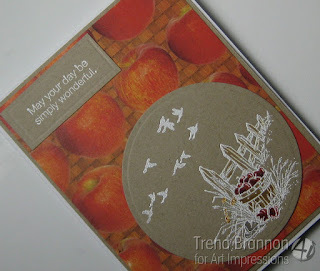 I was inspired by the design to make the thank you card. I drew the letters with a pencil first, then outlined with a black permanent pen. I also drew a little turtle. After the ink dried, I erased the pencil lines. I filled in color (B26, R29, Y08. YG05) in the same pattern as in the tee shirt. Over the weekend, I had a wonderful time with my creative sister Sandy at our Tracing Memories Class, lead by Sharing Artist Extraordinaire Marianne (my name for her as I just love her classes!). Look at all those luscious markers (those are Karen's hands - our lovely table-mate from Grand Rapids). I highly recommend attending any of Marianne's classes! All the Copic classes I've attended have been great! I met many of the Copic instructors when I attended my intermediate certification class - they are all talented and very helpful.